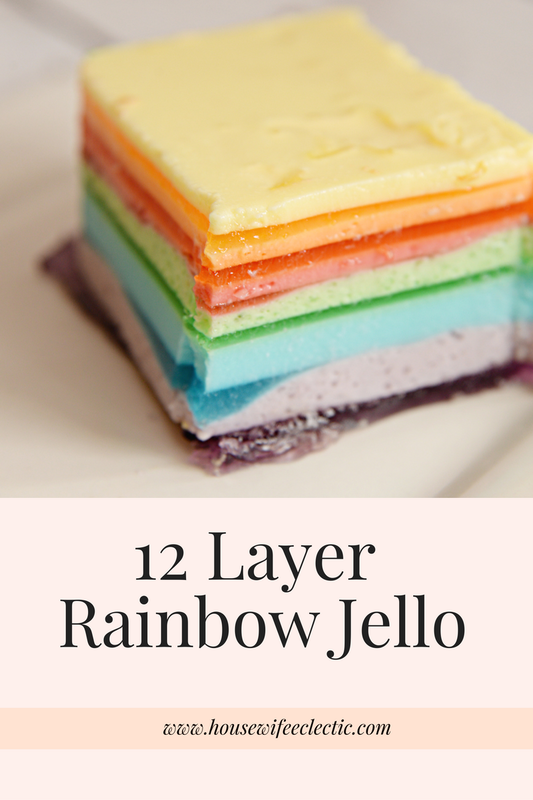 This 12 layer Jello is always so much fun to make. It is a rainbow of six different colors. It does take quite a while to make it, just because every layer needs to set, but it always gets quite the reaction from everyone who sees it and it is delicious too! Dissolve your first box of Jello in 1 cup of boiling water. Separate the dissolved Jello in half, into two bowls. Add two tablespoons of cold water to one and then put that bowl into a clear 9×13 pan. Place the pan flat in the fridge and allow to set for 30 minutes. When the 30 minutes is up add 1/3 of a cup of sour cream to the other bowl of Jello that has been sitting at room temperature. Mix until well combined. 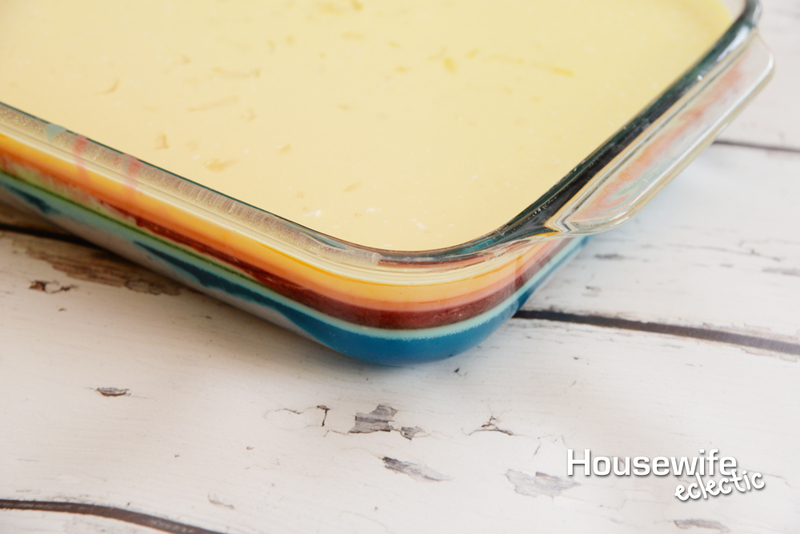 Pour the new layer of Jello in the 9×13 pan and place back in the fridge for 30 minutes. Repeat until you have all 12 layers. 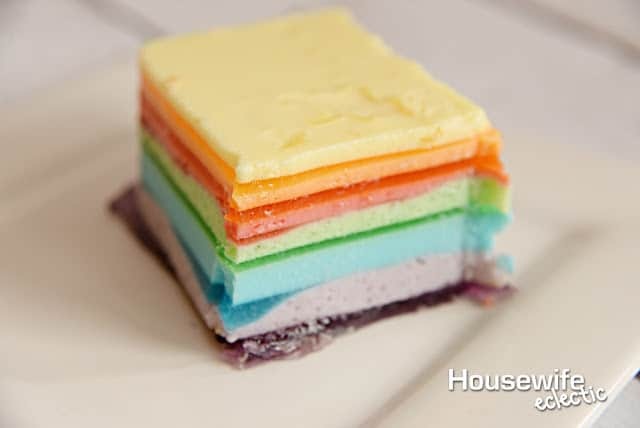 Make sure the pan is as flat as possible when you put it in the fridge so your rainbow doesn’t turn out crooked. This Jello recipe takes quite a bit of time but most of that is just waiting for the Jello to set and the it is so worth it! ok I am just a bit confused. won't the hot jello from the next batch melt what you have just "set" up?? I might want to say …when you go to do the next color do you start from the beginning?? I think this would bet fun to do, hope you can help me not be confused. When you make jello you add cold water. I suggest using a cocktail shaker, ice, and water to use as the cold water. This should cool down the mixture enough to pour atop the sour cream-jello layer. never seen such a pretty rainbow jello layer cake, wish i can get to try it because i dont think i can make it!